The National Renewable Energy Laboratory (NREL) recently published new weather data for over 1,000 locations in the U.S. called TMY3 data, for �Typical Meteorological Year 3�. 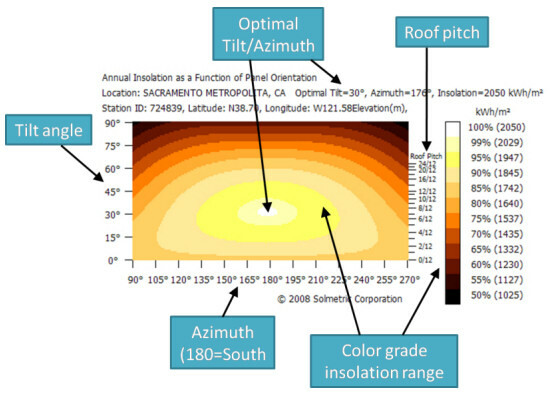 Using this data, Solmetric has calculated insolation values in kWh/m2 for a range of fixed tilt and azimuth values and produced a color grade chart for each of these NREL locations. The example chart below highlights the main elements of the plot. All data calculations are done without shade. Shade can impact these insolation values, and shift the tilt and azimuth optimum values, for example shade in the east may shift the (lowered) optimum value to the west. With shading data and Tilt Orientation Factor (TOF), Total Solar Resource Fraction (TSRF) can be calculated. Annual insolation is calculated by integrating the hourly TMY3 insolation values for the year at each tilt/azimuth combination. The Perez model is used for the calculations. See Perez, R.; Ineichen, P.; Seals, R.; Michalsky, J.; Stewart, R. (1990). "Modeling Daylight Availability and Irradiance Components from Direct and Global Irradiance." Solar Energy, 44(5), pp. 271-289.